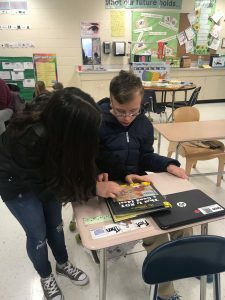 Sixteen students with a range of intellectual and physical disabilities, including Down’s syndrome, autism and cerebral palsy, follow the Exceptional Children (EC) Extensions programme at Randolph IB Middle School, North Carolina, USA. “As stated within the IB mission, our EC Extensions programme consistently strives to develop an atmosphere that is inclusive and compassionate, and is a proponent of all kinds of lifelong learners,” says Noelle Glass, EC Extensions Teacher at the school. The school adapts the Middle Years Programme (MYP) to fit state requirements. Glass, who works with another lead teacher (Courtney McQuillan) and three teaching assistants (Peggy Byers, Kim Weissinger and Tony Womble), explains that they “embed the IB within the North Carolina Common Core Extended Curriculum through including IB concepts, global contexts and IB learner profile elements”. One way the programme creates an inclusive learning environment is by having a peer buddy programme where students with and without disabilities collaborate together. IB Coordinator Sarah Graboyes explains that every morning peer buddies from the school’s 7th and 8th grades help the students in the EC Extensions class with their academic studies (mathematics, science, language arts and social studies). A peer buddy system encourages positive social relationships to develop and offers learning opportunities and benefits for all involved. The MYP key and related concepts are included throughout the curriculum. “For example, in our school garden, we discuss the food web/chain and what happens if it is altered (key concept: change). This may stem from a discussion of the animals in the garden or what happens if we remove plants. Our classroom has also taken on the task of rebuilding picnic tables, which have been eroded by the weather. We are focusing on the concept of change in regards to how their appearance has altered,” says Glass. “The school garden is our outdoor classroom and we strive to include all grade levels, classes and community stakeholders in the development of this space and our content. “We have recently had a grant fulfilled to buy texts focused on the IB learner profile attributes for our classroom library. 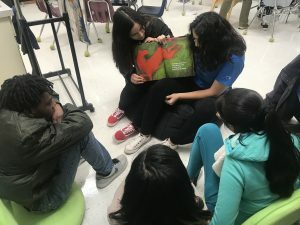 The intended use is to have our peer buddies read along with our students and host discussions based on the attributes and how they are seen in the texts,” says Glass. The EC Extensions programme also supports the language acquisition requirement through embedding a Spanish course every day, focused on basic vocabulary and simple phrases. The students have pen pals through the Kupenda for the Children organization, which sponsors schools for students with disabilities in Kenya. “Our students look forward to sharing with their pen pals, as well as hearing about their daily activities and school events. This intercultural and globally focused activity has brightened our students’ own learning experiences and compassion as they have learned about their friends’ lives,” says Glass. Within the lessons, differentiation is provided for each individual student in order to support their understanding of content. “This can take a wide variety of forms and speaks to the skills of the teachers and assistants as we work daily to encourage all of our students to be IB learners,” explains Glass. During the school day, students also receive services such as physical therapy, occupational therapy, speech and language therapy. “Previous students who have participated in our IB programme, have gone on to be very successful in the High School Extensions programme,” says Glass. IB educators can go the programme resource centre for materials about inclusive education. Click here, or navigate via the programme resource centre > IB Education > Supporting Material > Inclusive education.